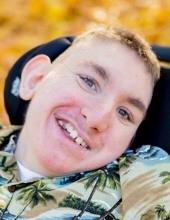 Alexander Paul Howitzer Hoover, age 15, passed away on Tuesday, February 5, 2019, at Sacred Heart Children’s Hospital in Spokane, WA. Alex was born on January 7, 2004, in Spokane, WA to parents Nathan and Shelloy Hoover. Known for his huge smile and infectious laughter, Alex was a happy, well-loved teenager. He loved being outside, taking car rides, playing Bambino baseball, watching his favorite shows, and absolutely loved being sung to. Alex was incredibly strong, defying the odds since the day he was born. He spent 117 days in the NICU, fighting to show everyone just how strong he was. He was a 7th grade student at Salk Middle School, achieving all the goals that were put before him. Alex was, and always will be, incredibly loved, not just by his parents and family, but by countless friends, teachers, classmates, and baseball teammates. Alex is survived by his parents, Nathan and Shelloy; his grandparents, Ellen and Mike Campbell, Bud and Mary Stratton, Rick and Darla Mace; and multiple aunts, uncles, cousins, and friends. He left this world, joining his big brother, Richie Hoover; his beloved Grammy Carol Hoover; and Grandpa Ed Hoover. Viewing will be held Thursday, February 14th from 10am to 5pm and Friday, February 15th from 10am to 5pm at Heritage Funeral Home. A funeral service will be held at 12:30 on Saturday, February 16th at Heritage Funeral Home followed by a graveside service at Greenwood Memorial Terrace. To send flowers or a remembrance gift to the family of Alexander Paul Howitzer Hoover, please visit our Tribute Store. "Email Address" would like to share the life celebration of Alexander Paul Howitzer Hoover. Click on the "link" to go to share a favorite memory or leave a condolence message for the family.